Questions (Multiple Choice and Free Response) involving rotational motion were discussed on various occasions on this site. Essential formulae to be remembered in this section were discussed in the post dated 20th January 2008. You can access all the posts related to this section by clicking on the label ‘rotational motion’ below this post or by trying a search using the search box provided on this page. In both cases you need to use ‘older posts’ links to obtain all related posts. (1) A metre stick of mass 0.2 kg can be balanced on a knife edge at the 60 cm mark (see figure) when a piece of rock (specific gravity = 3) fully immersed in water is suspended from the 70 cm mark. If the piece of rock were in air, suspended from the 70 cm mark itself, what would be the position of the knife edge for the balance? The weight of the metre stick acts through its centre of gravity, which is at the 50 cm mark. The torque due to the weight of the metre stick tries to rotate it in the anticlockwise sense where as the torque due to the apparent weight of the piece of rock in water tries to rotate the metre stick in the clockwise sense. These torques have equal magnitudes since the metre stick is horizontal. Since the lever arms are equal (0.1 m each), the apparent weight of the piece of rock must be equal to the weight of the metre stick which is equal to 0.2 kgwt. [Note that we got the above result by equating the magnitudes of the torques: 0.2×0.1 = w2×0.1 where w2 is the apparent weight (or, the weight inside water) of the piece of rock]. Therefore, w1 = 0.3 kgwt. The position of the knife edge is therefore 50 cm + 12 cm = 62 cm. (2) A sphere rolls without slipping along a horizontal surface. If the velocity of the centre of mass of the sphere is v, what is the velocity of the point of contact (with the horizontal surface) of the sphere? When the sphere rolls, it has an angular motion (rotation) and a linear motion (translation). If the the horizontal surface is perfectly smooth, the sphere will slip fully and will just spin about its central axis. In other words, it will have angular motion alone and the velocity of the contact point will be v, directed backwards. When the surface is rough, the sphere rolls forward and the centre of mass moves forward with velocity v. Since the sphere is rigid, the contact point (lowest point) of the sphere too has to move forward with the velocity v. Since the contact point has an additional backward velocity v due to the spin of the sphere, the resultant velocity of the contact point on the sphere is zero [Option (e)]. [In the above question what is the velocity of the top point of the sphere? You can easily show that it is 2 v, forward]. (3) For opening a door 1 m wide, the minimum force required is 20 N. If the door is pushed at a distance of 0.4 m from the line of the hinges, what is the minimum force required for opening it? The force required for opening the door will be minimum if it is applied perpendicular to the plane of the door, with the point of application of the force farthest away from the line of the hinges (at the edge of the door, opposite to the line of the hinges). This ensures that the torque produced by the force is maximum. Evidently the minimum torque required for opening the door is 20×1 Nm = 20 Nm. [Remember that torque = force×lever arm. It is the torque (and not the force) that matters for opening the door]. Therefore, F = 50 N.
The angular acceleration of the cylinder is α = d2θ/dt2 = 6 rad/s2. 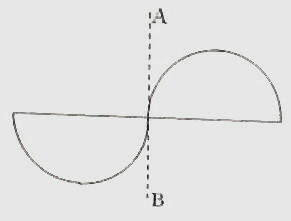 τ = I α where I is the moment of inertia. Since this is constant (independent of time), option (e) is correct. [The expression for the angular displacement θ is similar to the expression s = ut + ½ at2 for the linear displacement in uniformly accelerated motion. Therefore from the form of the expression itself you should be able to understand that the angular acceleration and hence the torque, is constant]. The moment of inertia of a hemisphere about a tangent such as AB must be half of this. Since the axis AB is the common tangent to the two hemispheres, the total moment of inertia of the system containing the two hemispheres must be (7/5)MR2. Also R = r as given in the question. You will find few more practice questions (with solution) in this section here.